KATHMANDU, NEPAL—Confirming the worst fears of friends and family, authorities announced Thursday that a Himalayan goat that went missing 10 days ago on the treacherous southwest face of Mount Everest has died following a failed ascent. “At approximately 8:30 a.m. this morning, a group of Canadian climbers discovered the body of a 7-year-old male Himalayan tahr; we can now confirm that it is indeed Ngodap Goat,” said Everest Search and Rescue team leader Ross Barnwell, noting that unseasonably cold temperatures, coupled with the goat’s refusal to carry supplemental oxygen, may have contributed to a tragic outcome that authorities are attributing to caprine error. “We can take some solace in knowing that the young buck died doing what he loved. Other members of the herd attest that he had a consuming passion for scampering through the foothills, climbing sheer rock faces, and maintaining a diet of mostly grass since he was just a kid. 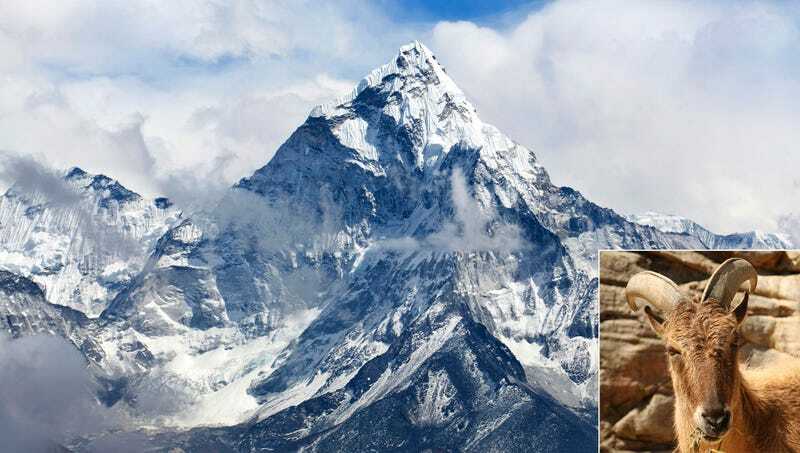 It’s a damn shame it had to end this way.” At press time, Everest Search and Rescue disclosed that two Sherpas hired to guide the goat are presumed dead as well.